We shake hands, eyes locked, smiles locked, connecting immediately. 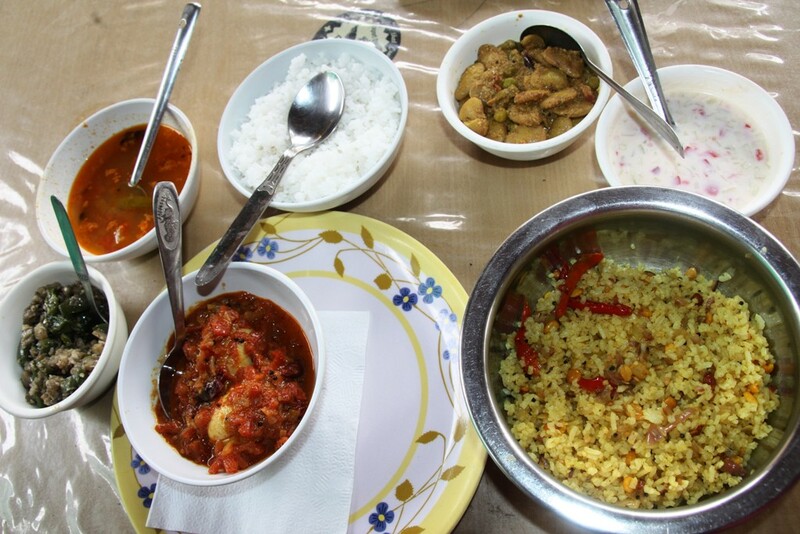 Viju’s face sports the warmth of a host when he welcomes a customer from a faraway place like Trivandrum; but the hand I now hold is cold and steely with the Coorg climate. “You must be tired.” he replies, still holding. Viju turns to introduce Deepthy, his wife, who is behind him. “Hi,” we say almost together, smiling. The couple lead me past a garden, rich with exotic flowers to the doorway of a cozy room in the cottage; a dark rectangular table lies outside on the veranda with four wicker chairs clinging to its borders. My requests grew in number. Before evening, they summon a jeep; toss me into it; instruct the driver to whisk me away to quite some distance so that I would not return and pester them anymore. Well… er…that is not the case! 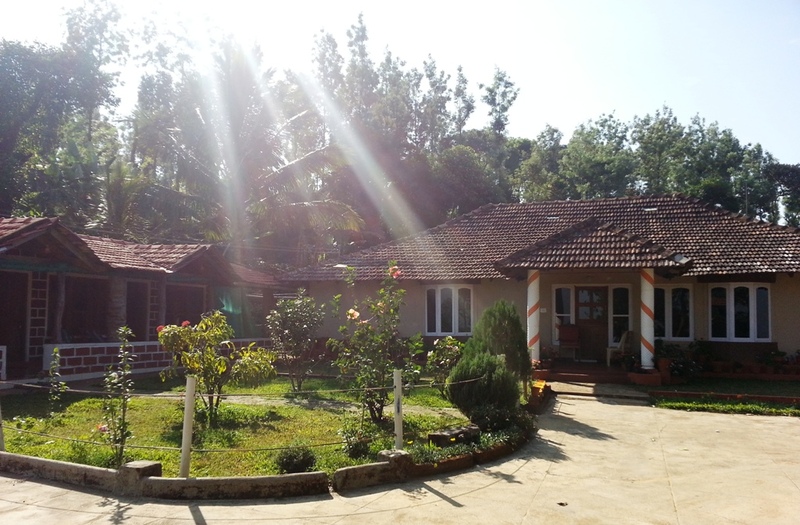 The King’s Cottage in Kakkabe (Coorg) is rich with many magnificent places in its neighbourhood. But with the sorts of roads around, you need a 4-wheeler to reach them. So the jeep, and here I go. The dirt road ahead winds through coffee estates but wherever it leaves the coffee smell behind and surges forward with a hope to burst into sunny spaces, huge trees from both sides speed up and take over, propelling their branches across, propelling them so hard that the lush dark leaves meet overhead only to recoil – now knotting, now unknotting, now breaking apart to display a dull sky, now drawing in to close the monotonous show – and once again run together to hold their hands firmly this time for a longer stretch, building an opaque pergola, keeping an ageing sun, perverted, voyeurish or just plain nosey out from all action. A cold eerie air hangs trapped inside the dark tunnel along which our jeep moves. Kakkabe is calm with Sunday. But my driver swears that it remains so round the week. A stay amidst Kakkabe’s lush plantations is itself an experience, an amusing welcome drink for the tired soul, much traveled. Now how is its neighbourhood going to top it up, I wonder as the jeep needles through the thin road, climbing. 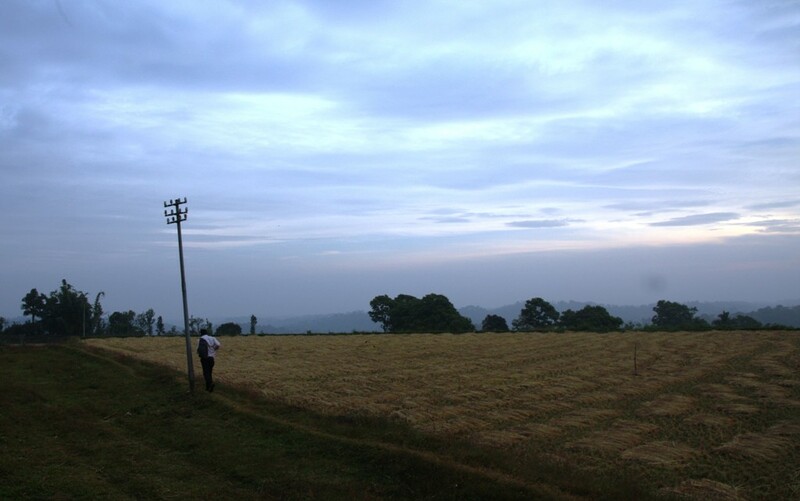 Thadiyantemole, the tallest peak in Coorg is 5 kms up the untarred road from the King’s Cottage. Nalnadu palace is a gem studded on the way. Chomagundu mount is where you shed your excess fat and adrenaline as you climb to watch the theatrics of a sun going hysterical every evening. Finally there is the Chelavara falls to wash away the fatigue from mind and muscles (Forget it boy, if you are not the water type in cold climate: The water is one continuous ice-slab). Tell you the truth: I don’t like jeeps stopping whenever they catch a mountain head-on. Experience has taught me this: a jeep stops, business ahead. “Sir, we cannot go beyond this. You climb. Wait I,” the driver tells me in broken Malayalam, standing up on the break pedal. My calf muscles and fingers sear as I crawl uphill the Chomagundu. The sky is jam-red at the top. Only the air stays vanilla-white, fresh and crunchy. Tired, I sit on the ground, wearing my glass, posing for a camera that fires madly in auto-mode. I have the whole mountain for myself; I have a setting sun and rich tufts of clouds strewn around on a dramatic sky. All for myself. I look on and on. I look on and on, look on and on until the clouds turn degree by degree into what seem like fluffy appams dunked in spicy-red beef curry. This is it! See! This is it, I told you! This is what happens when you watch nature on an empty stomach; I’ve begun to see things through my hunger. I descend with the sundown, and descending catch the bright red flecks from the western clouds full on my face for a moment. My driver, waiting deep down at the foot of Chomagundu, catches a figure blazing for an instant on the slope of the hill; he waves at it. I wave back, unaware that I carry the legacy of the sun for a second, my one moment of glory and pass. The whole night, King’s Cottage remains bathed in moonlight. I don’t see the moon; but my eyes are fast on half a dozen lights that burn on the slopes of a distant mountain. Strains of music drift in, in tatters along with the cold mountain wind. “But they could hurt the environment, the animals!” I tell myself, a bit aloud. “There were once elephant tracks over there. Now a days, no animals come that way,” Viju replies, with a tinge of pain. Coorg takes more resorts than tourists these days. The dregs of a melancholic night remain even as I wake up early morning. I decide to take a stroll outside my cottage along the paddy fields to kill the hangover. Here I saunter with a glass of black coffee in hand, its steam wafting up and dissolving into the haze that hangs over the light brown field. I glide through the ridge of the field obsessively, part in trance, part meditatively, waiting for the first birds to rise and cheer me up. But then I stop, turn and glance across once again at the faraway mountain where I saw those lights burning last night. Just the green forest! The mountain hardly shows any signs of the merriment that went late into the night. It swathes its blisters with a fine layer of mist, and sleeps tranquilly beneath it. NB: Kakkabe is 38 kms from Madikkeri, the capital of Coorg. A stay in a cozy room in the King’s plus all the meals will set you back by a meager thousand bucks. 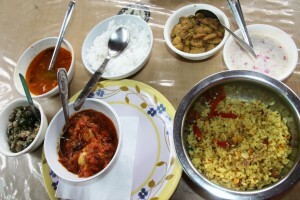 I am happy to endorse the traditional Coorg food they serve. Among the coffee plantations, your stay will be comfortable. Bring the right gear to fight the low temperature if you come in winter . Service is rated excellent (Thanks to Deepthy who spent her valuable time enlightening me, another story on Coorgi culture is on the way. You can contact King’s Cottage at 09845963883). Manu, excellent travel story. I have never come across something as evocative as this recently. We are waiting for your book to come to the stands. Touch wood! Thank you Vipina. Keep visiting the site. Keep commenting. Have always had Coorg in the list is places to visit. Hope the proliferation of resorts has not destroyed the natural serenity of the land. 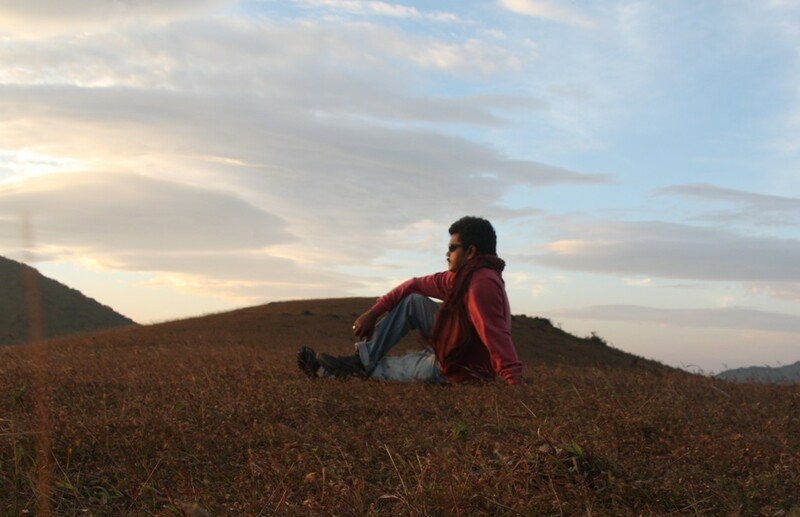 Thanks Manu, for sharing your travelogue. Thanks a lot sit for the comment. Is July an ideal month to visit Coorg? July is fine, if you love the rain Binuraj. 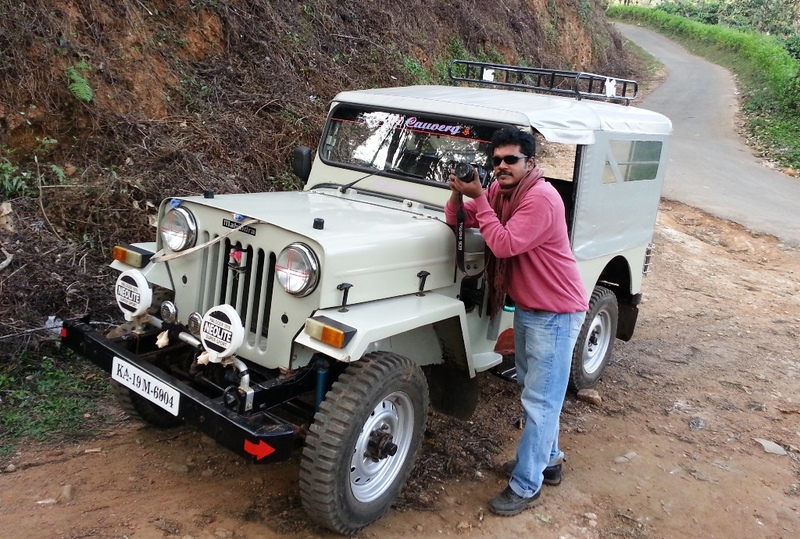 I went to Coorg in one summer many years back and was disappointed.